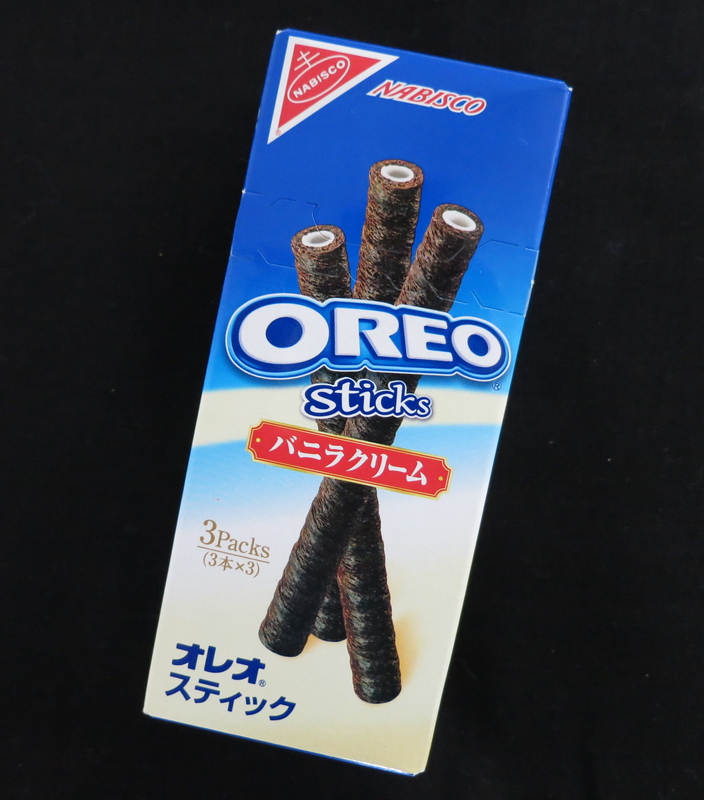 Sure, Oreo Sticks are a western import, but they’ve been IMPROVED to suit Japanese tastes. This is what happens to pretty much everything that comes to Japan, from foreign-born sumo wrestlers to pizza. In the case of Oreos, the ratio of creme to cookie has been carefully adjusted so they’re barely sweet, and because the white stuff is sealed neatly inside the crunchy bit, there’s no way to avoid consuming it just as the manufacturer intended. If you’re a bashibazouk who’s accustomed to screwing off the top cookie, scraping the creme off with your front teeth, then eating the cookies parts last (you know who you are!) hang your head in shame. If you’re one of those iconoclasts who peeled off the creme and ate the cookies first, saving the creme for last (not that we know anybody who did this): off to remedial cookie consumption school! Oreo Sticks have been engineered to deliver the proper taste, in a shape that doesn’t make a mess, in a quantity far smaller than a single serving size elsewhere in the world. But it doesn’t stop there. Check out the packaging. No big bag that begs you to eat a boatload before they go stale. 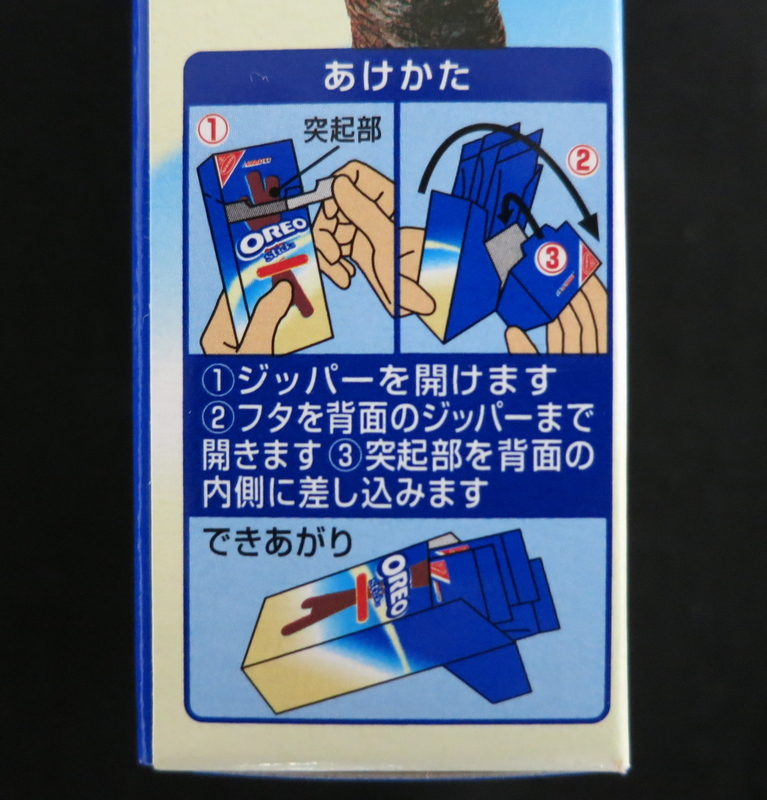 Oreo Sticks come three to a hermetically sealed packet, three to a box. And on the side is a helpful diagram showing how to set up the meticulously designed package so your snacks are presented at the perfect angle when your next craving hits! I *love* this! What an intelligent response to a problem I never knew I had. Oreos are too sweet for me (as are most American confections) and a less-sweet oreo would be attractive. They’re definitely a different experience than eating regular Oreos! In addition to being less sweet, the long, thin stick format is a real favorite here in Japan because it can be eaten without dropping crumbs. To be honest, I’m just guessing what went in in the minds of the developers, but I wanted to write about Oreo Sticks because the way they are designed and packaged seemed like such a perfect example of how life is here, in general.